Meriç Algün Ringborg‘s exhibition, A Work of Fiction at Stockholm’s gallery Nordenhake prompted a lot of negative associations, and I found myself in an unfortunately common critical bind: I’m not sure whether to attribute my response to this particular work or work like this. Given the sinking vehemence the exhibition prompted, I’m guessing it’s plenty of both. Algün Ringborg’s show spread through three rooms: in the first, an overhead projector sent up a list of words on a bare white wall. Behind this wall began was the first of several semi-domestic installations of objects arranged in a state of interruption, as if a person (the artist?) had vanished in the midst of a casual research project. 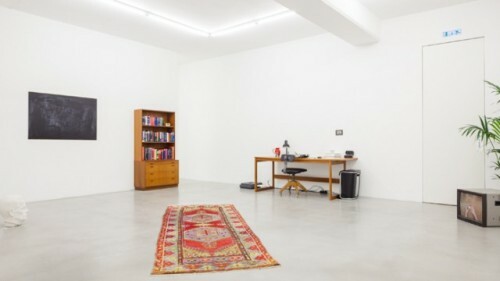 Books, mirrors, TV monitors, vitrines, sculptures, and houseplants filled the spare gallery spaces, along with a meandering spoken text, suggesting – what? I don’t know, something about the ineffability of knowledge, the freedom of a text, the problem of authorship, and the methodology of writing. Y’know, theory. Theory without exception. I found this work desperately boring and unimaginative, a species of artwork whose address is and will continue to be hashed and re-hashed endlessly across a galaxy of MFA programs, one regurgitated reading list after another; a Documenta-lite tradition of conceptual work too concerned with narrative to really earn its concept, and too self-reflective, too concerned with language to actually be anything. And yes, this isn’t really a fair estimation of this exhibition in particular but then again there really wasn’t much to set it apart.